Here's a comprehensive guide to fantastic Virginia Beach area holiday light festivities and fun in November. 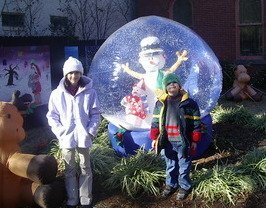 You'll find information on spectacular light and figurine displays, like Portsmouth's Courthouse Galleries' Winter Wonderland, parades such as Norfolk's Grand Illumination Parade, ice skating rinks and shows, Colonial Williamsburg's historic and famous Grand Illumination event, and more. Santa in the snow? Yep, and on roller coasters too. 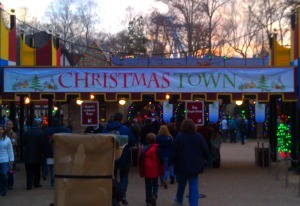 Click here for the latest hours and discounts for Busch Garden's own winter wonderland adventure. Light festivities begin with the Grand Illumination of the Olde Towne Portsmouth and Downtown Norfolk skylines. Pre-parade entertainment starts at 4 pm and includes music, dancing performances, and a variety of family entertainment including face painting, parachute fun, crafts, and more. The grand illumination and parade starts at 7 p.m. (begins at Waterside Drive and goes down St. Paul's Boulevard). It's a fabulous (and free) way to kick in the season. For details, go to holidaysinthecity.net. Santa...in the sand? 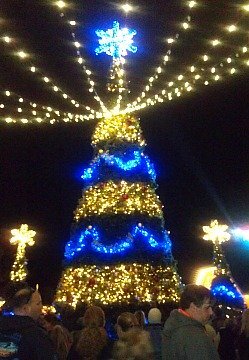 Holiday Lights at the Beach is a magical family fun attraction. Located at the Virginia Beach Boardwalk, it's the perfect way to start the holiday season. Click here for more Holiday Lights at the Beach info, including the cheapest days to visit and how to save $7! Glide your way into the season at this temporary ice skating rink next to MacArthur Center. $7 for 2 hours of skating fun + $7 for skate rental. Groups of 10 or more save $1 per person. Military and family get $1 off (must have valid military ID). Magical Snowfall - Monday-Saturday at 6 pm, 7:30, and 8:30 pm, as well as on Sundays at 6 pm and 7 pm. DJ Nights - Saturdays from 8 pm to 11 pm enjoy free dance music to skate to. Date Night Skate Nights - Wednesdays 7 pm to 10 pm (through Jan. 10) enjoy two skate tickets and two hot chocolates for $25. Skating Santa - Dec. 9 and 13, 2 pm to 3 pm - get your photo taken with Santa on the ice. Wear a holiday outfit and get free skate rental. Disco Nights - Dec. 8 and Jan. 5, 8 pm to 11 pm - enjoy disco music glow sticks and more. Free skate rental to those who come in disco costume. Paint the Ice - Jan. 15, 6 pm to 8 pm - all ages are invited to paint the ice for free. Afterwards, the Zamboni will seal in the artwork for an art rendering to skate on. Ice skate next to the museum at this annual family tradition. Skating is $7 per person, $6 for museum members, NASA employees & active military. Skate rental is $2, or you can bring your own. Open Fridays, 4 pm to 10 pm, Saturdays, 11 am to 10 pm, Sundays noon to 8 pm. Go to www.vasc.org for details. In previous years, Busch Gardens pass holders got $3 off. Check to see if they're offering that deal again this year by going to the vasc.org site. They also have a Winter Fun Pass for $26 which includes exhibit admission, ice skating, MAX Flight Simulator, IMAX admission, carousel ride, motion simulator and 10% off in the Cosmic Cafe & Imagination Station: One Stop Science Shop. Join Portsmouth's kick off to the holiday season and stroll past antique cars and windows painted with old-fashioned holiday themes. Many art galleries, antique shops, and boutiques will provide refreshments and music. In past years, a police officer helped us toast marshmallows over a wood-burning pit on the street corner! 5 p.m. to 8 p.m. Free. For more information, call 757-405-3500 or go to www.portsvaevents.com. You might have seen them as a kid...now you can be dazzled by your favorite animated figures from the former Coleman Nursery's famous Winter Wonderland collection. They'll be on display at the Courthouse Galleries at High and Court streets. Free for museum members, for non-members it's $3, which includes Winter Wonderland and Andalo’s Clubhouse. You can also get a $12 pass which includes two visits to the Wonderland plus one visit to the Childrens Museum of Virginia. The hours are: Tuesday-Thursday 9:00am-5:00pm, Friday-Saturday 9:00am-8:00pm, Sunday 11:00am-5:00pm, Christmas eve and New Years eve 10:00am-5:00pm. Closed Mondays and Christmas Day. For details, click here. Welcome in the holiday season with special programs at Colonial Williamsburg. Highlights include the Dec. 3 Grand Illumination (free fireworks and fun! 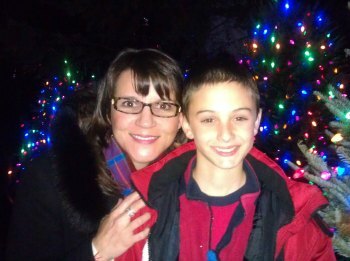 ), community Christmas tree lighting, holiday music concerts, and walking tours of decorations. Open daily. Admission required for most events. For details, go to www.history.org. "Mystery of the Christmas Star" combines holiday fun, science, religious history, and music to explore the story of the Star of Bethlehem, which led the wise men to Jesus' birthplace. Was it a planet, a comet, a supernova, or just a miracle? Admission $6. They also offer a holiday Laser Show from time to time. For more information, call 757-595-1900 or go online at http://www.thevlm.org/. To find out why our kids "flip" for horseshoe crabs at the museum, click here. 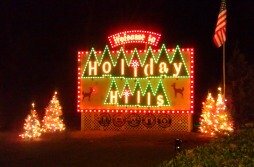 A two-mile drive through holiday light, animation, and wonderland whimsies lit by over 700,000 lights-- Virginia's longest running drive-through light event. Daily, 5:30 p.m. to 10 p.m. Admission is $10 per car and $50 per bus. (Note: on Friday nights in previous years, the first 500 cars got a free give-away gift. No word yet on whether they are offering that again this year.) For more information, call 757-926-1400 or go online at http://www.nnparks.com/. Admission: Adults $7, Children $2, under 6 free. Get 50 cents off admission if you bring a canned food donation. For more information, call 757-417-7771. End of November - Dec. 31 - Norfolk Botanical Garden "Garden of Lights"
Our family had such a memorable time visiting this 2.5 mile winter wonderland of holiday light last year! Located next to Norfolk International Airport, it's a much quieter and less crowded alternative to the Holiday Parade of Lights on the Virginia Beach Boardwalk. And it's just $15 per car when you visit Monday-Thursdays. (Tip: have dinner at nearby Baker's Crust **YUM! ** then top off your evening cruising the holiday light show!). Admission: Monday - Thursday $15 per car (cash only), Friday - Sunday $20 per car. Nightly - 5:30 pm - 10:00 pm. Ticket deals: $25 gets you a combo ticket for the Garden of Lights and the Virginia Beach Holiday Lights; Military Monday nights: $10 per car with military ID; Tuesdays Member Nights; $10; City of Norfolk employees and Food Lion card holders get in for $14 Mon-Thurs. For details, go to norfolkbotanicalgarden.org. The Lewis Ginter Botanical Garden is hosting its annual GardenFest of Lights. More than half a million holiday light attractions are on display in a fantasyland with forms of flowers, fairies and woodland creatures. Holiday light form displays include majestic peacocks, "snow stars" illuminating the dome of the Conservatory, alligators, and a giant "green man" at the center of a puzzling maze. 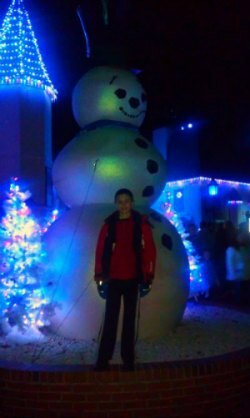 A huge snowman at Busch Gardens Christmas Town. 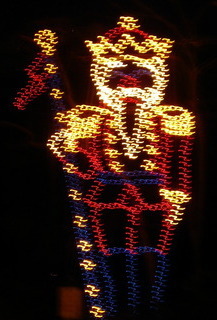 Nightly, 5 p.m. to 10 p.m. Closed December 24 and 25. Admission: $11 for adults, $10 for senior, $7 for children, under 3 free. For more information call 804-262-9887. Never knew Santa was such a sportsman, did you? Join Santa as he dives into the gigantic Chesapeake Bay Aquarium tanks to feed the fishes at 11 a.m. each weekend. Admission. For information, call 757-385-FISH. Family-friendly Hunt Club Farm reopens its Winter Wonderland Christmas Barn. This time it will feature "A Magical Forest Toyland" featuring animated animals and elves. Don't miss the Petting Farm holiday light displays and kids' maze, live animal nativity, and (our favorite) roasted marshmallows! The farm is open on select days. Nov. 28-30, Dec. 5-7, 12-14, 19-24, and 26-31, noon to 9 pm; closed Christmas. Admission:$7. For more information, go online to huntclubfarm.com/. Click here for more December Events or go to my Site Index to help find what you're looking for.